Home / Adults / Bee Positive! I personally owe bees so much. Without their pollination, we would not have coffee, a substance on which I am wholly dependent. All of my favorite fruits (apples, peaches, mangoes, bananas, melons, and cherries) depend on bees, as well as my favorite flower – sunflowers! As someone who can’t have dairy, I rely on almonds, cashews and coconuts for essentials like ice cream and coffee creamer. What would I even eat without bees? Aside from being helpful, bees are fascinating creatures. They are amazing communicators. Whenever worker bees return to the hive, they perform a dance composed of figure eights and waggles to indicate where food sources are. Bees can beat their wings 200 times per minute. The average worker bee lives around five to six weeks and produces 1/12th of a teaspoon of honey in that time. Despite their short life spans, bees typically manage to produce 2-3 times the amount of honey they need for the Winter. 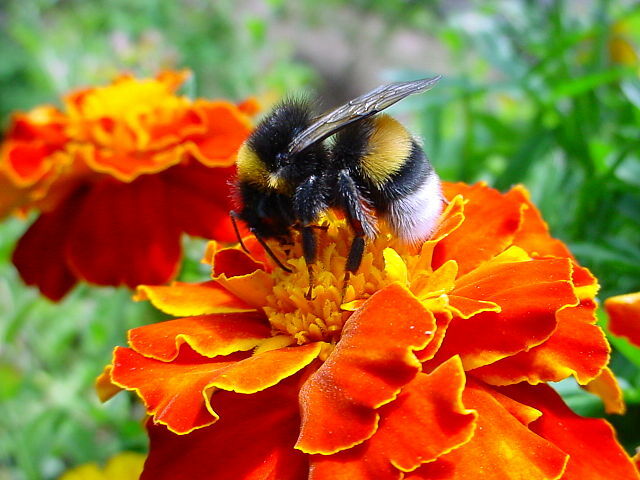 By planting bee-friendly plants, you can attract bees to your yard and provide them with the proper nourishment. You’re not only making the world a more beautiful place by supporting bees, but also by planting flowers to brighten the landscape. Bees are most attracted to blue, purple, white and yellow flowers. You can also bolster your kitchen with herbs such as basil, oregano, mint and lavender. Even if you don’t have a big yard, every little bit, even a window box, helps. Books like “Planting for Honeybees” and “Victory Gardens for Bees” can give you some guidance so you can work with what you have. One of the biggest things I have learned from working in a library is how empowering research can be. While beekeeping may seem like an intimidating prospect, and it can be hard to know where to start, I would encourage you to read up on it. Books like “The Beekeeper’s Bible” and “Beginning Beekeeping” offer helpful information for aspiring and beginner beekeepers. If you live in the city, know that urban beekeeping is a growing practice, and books like “The Rooftop Beekeeper,” “Keeping Bees in Towns and Cities” and “Buzz” can tell you all about it. You can make an impact with even a small space. Naturally, if you’re renting, it would be difficult to sell a landlord on allowing beehives, but you can still plant a window box and buy local honey. If these books whet your appetite, mark your calendar for an upcoming program from the Boone Regional Beekeepers Association at the Columbia Public Library on Saturday, June 22. Do your part to save the bees – because without bees, I wouldn’t have coffee.